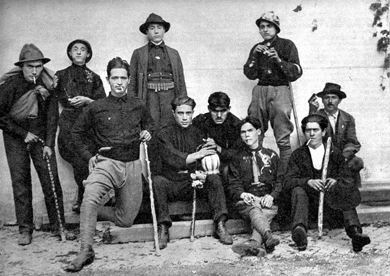 Italian Blackshirts in the early 1920s. There is a Fascist song from those times that says (translated), “Fascists and Communists were playing cards. The Fascists won with the ace of clubs.” But the clubs used by the Fascists were only a marginal elements in a struggle that had as a fundamental factor the supply of energy to the Italian economy. History, as we all know, may not repeat itself, but it surely rhymes. So, the theme of a civil war and of a return of Fascism is much discussed in the US nowadays. What kind of rhymes with past events can we perceive? On this point, I can propose to re-examine how Fascism took over in Italy, in the early 1920s, and in particular how it was related to energy supply factors. It is not, and it cannot be a complete analysis, but maybe it can help us understand what’s going on. In the 1920s, Italy was reeling from the tremendous effort of the First World War while the major allied powers, Britain, France, and the US, were carving the pie of the victory among themselves, leaving only crumbs for Italy. There were reasons for that; the main one was that the Allies saw Italy as more of a burden than a help during the war. In any case, there had been no “peace dividend” for Italy. That was not the only problem for Italy, an even more important one was the dependency on British coal for its energy supply. In the aftermath of the war, the British coal production had peaked was headed for decline. You can see the data, below. The two low points under the production peak correspond to the two major strikes of the coal miners of 1921 and 1926. But, even without strikes, the British economy was undergoing a major readjustment. Coal was not any more so abundant as before and that had effects on the British coal exports. In turn, that created an energy crisis in Italy. You can see in the data, below how coal imports from Britain had plummeted immediately after the war and how imports from Germany were initially insufficient to compensate the decline. All this had political consequences. Most Italians couldn’t understand why the victory in the Great War had brought to them only more poverty than before. Nor they could understand why the perfidious Britons were denying them the coal they justly deserved (you can read about this feeling in D.H. Lawrence’s “Sea and Sardinia” of 1921). A delusionary attitude became widespread as a consequence: it was widely believed that Italy was singled out as an enemy by the decadent Northern Plutocracies because they envied the strength and the power of the young Italian nation. In its extreme form, this illusion stated that Italy had won the war for the Great Powers with the offensive of Vittorio Veneto in 1918 and that, again, the Great Powers didn’t want to admit it because they loathed the power of the young Italian Nation. That was repeated so often that it became an obvious truth in Italy. Eventually, it led to to the overestimation of the country’s military power, with disastrous consequences during the 2nd World War. Incidentally, a similar delusionary belief was common in Germany during these years: that the defeat of the country in WWI had been caused by the “stab in the back” received by the Socialists. Eventually, a local strongman, Benito Mussolini, emerged from the struggle as the winner and he and his Fascist party took power with the “March on Rome” of 1922. It was a bloodless coup, carried out with the support of the traditional elites, including the King of Italy. They were hoping that they could neutralize Mussolini and turn his movement into something that they could control. In the short run, they were right. When the new Fascist government took over, in 1922, it benefited of two favorable circumstances; the main one being that the energy supply to the country improved. Coal imports from Britain had restarted, although not at the same level as before but, at the same time, the German coal industry had also recovered. Germany coal production would not peak until the late 1930s, and that meant that imports from Germany could now compensate the stagnating British production. In the long run, that would lead Italy’s to a deadly embrace with Germany during the 2nd world war, but in the 1920s it was a vital flow of energy for the Italian economy. The second favorable circumstance for Mussolini was that the previous governments had slashed military expenses down to 2% of the GDP from the more than 10% they had been during the war. Despite all of his warlike rhetoric, Mussolini was smart enough that he didn’t increase the military budget, at least initially. Without the burden of large military expenses and with a good supply of coal, the Italian economy experienced a minor renaissance. Inflation disappeared and resources could be dedicated to rebuilding the civilian industrial infrastructure. Mussolini could even indulge in the attempt of creating a national coal industry by exploiting the coal deposits in Sardinia. It always remained a toy mine, but it had good propaganda value. Finally, Italians seemed to believe that a dictatorship was preferable to civil war and that made things relatively easy for Mussolini, who didn’t need to recur to extreme repression measures, at least at the beginning. Of course, as we all know, eventually, Mussolini became a victim of his own propaganda. In the 1930s, the regime became harsher, the military budget was tripled and Mussolini engaged the country in a series of senseless wars, eventually leading it to defeat and humiliation. This is an oversimplified presentation of a series of complex events, but I think it may be useful for us to understand what are the main elements that can lead Fascism to take over anywhere in the world. After all, Fascism was an Italian invention, much admired by dictators everywhere. It was a combination of economic crisis linked to energy scarcity, of military victories turning out to be expensive defeats, and of a delusionary vision that blames foreign evil forces for all the ongoing troubles. So, if the look at the situation in the United States nowadays, one obvious similarity with Italy in the 1920s is how a military victory can lead to no advantage for the winning country. In the 1990s, the US triumphed against the Soviet Union in the cold war and that was expected to bring a “peace dividend,” but it never did. The US also successfully invaded Iraq in 2003 but, again, most Americans saw none of the advantages that had been prospected to them as the result of controlling the oil resources of Iraq. In terms of collective delusions, we certainly have plenty in the US, nowadays. One is seeing the US as “the indispensable country,” greatly overestimating the country’s military power. Another is the idea of “energy dominance.” It is unbelievable how many people in the US think that the fact that the country now produces more oil than it imports (which is correct) means that the country is not dependent on imports anymore (which is incorrect, of course). Even the Energy Secretary, Rick Perry, recently said that the US exports more than it imports, and this statement wasn’t challenged in the mainstream media. In any case, much of what is said and done in the US and in the West is based on the even more fundamental delusion that technological progress will solve all problems. Finally, we are starting to see plenty of sectarian violence in the US. People are openly talking of an ongoing “civil war” even though it seems that we are still far away from the level of violence reached in Italy after the 1st world war (but note also that the Italian violence of those times had no racial components). In any case, civil wars cannot last forever; eventually, one side must win and take over. So what can we expect for the future? Most of what happens to the economy of a country depends on the energy supply needed to make it function. This is not commonly recognized, but we saw how Italy danced to the coal tune during the years between the two world wars. In our times, fossil fuels, oil gas, and coal are what makes the world’s economy dance. And the availability of energy will determine the destiny of the United States. As we all know, the mood in the US is bullish regarding fossil fuels and it is true that both liquid fuels and natural gas underwent a renaissance with the “fracking” extraction technologies. That stopped the decline that had started with the peaking of the oil production, reached in 1970, and led to a new cycle of increasing production rates. But the time of rapid growth seems to be over for the US oil and gas industry. “Fracking” is not forever and a new phase of production decline may be starting, Then, note also that the US military expenses are still large, even though declining. They stand now at about 3.3% of the GDP, higher in relative terms than they were in Italy in 1922. So, the future of the US will depend on how much it will be possible to supply the industrial system with energy and keeping military expenses at a level compatible with the available energy. Even hoping that military expenses will not be raised again, in the future, it hard to think that the necessary energy to keep the system going could come from the exhausted American oil and gas fields. Could a new US government base a new economic renaissance on coal? That seems, indeed, to be Donald Trump’s plan. Re-open the coal mines, lavishly subsidize coal production, and, perhaps, take the road of coal liquefaction to obtain synthetic fuels. Then use these fuels to boost the economy, create jobs, rebuild the country’s military power and, probably, end the civil war before it becomes truly disastrous. After all, it is what Italy and Germany did, with some initial success, between the two world wars. But is it possible to convert the US economy back to coal? Probably not for two reasons: the first is that the coal resources in the US, although still abundant, are not anymore what they were in the past. The second is that making the world’s largest economy dependent on coal would give such a push to global warming that it would rapidly destroy the world’s ecosystem as we know it. But the fact that the task is hopeless doesn’t mean that it can’t be attempted. And a dictator who would attempt to do that has a good chance to do more damage to the country and to humankind than any dictator of the past ever managed. Ugo Bardi teaches physical chemistry at the University of Florence, in Italy. He is interested in resource depletion, system dynamics modeling, climate science and renewable energy. Contact: ugo.bardi(whirlything)unifi.it . He blogs at Cassandra’s Legacy where this article originally appeared.